Effective, soothing relief from IBS - painful spasms, bloating, trapped wind, diarrhoea constipation. Contains natural peppermint oil. 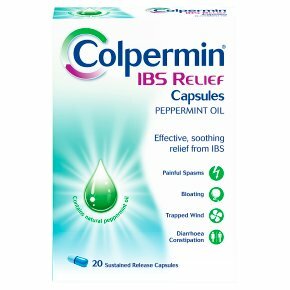 Colpermin® IBS Relief Capsules contain natural peppermint oil formulated in a sustained release capsule, clinically proven to provide effective, targeted relief from the symptoms of Irritable Bowel Syndrome. These capsules release peppermint oil where it is needed to relieve the symptoms of IBS including painful spasms, bloating and trapped wind, constipation and/or diarrhoea. Directions for Use: Swallow the capsule whole with a drink of water. Adults and elderly: One capsule three times a day; the dose may be increased to two capsules three times a day if necessary. Do not take immediately after food. Do not chew or break the capsules. Do not take indigestion remedies at the same time of day as this medicine. If your condition does not improve after two weeks of treatment, consult your doctor. Children: Not recommended. Please read the enclosed leaflet before use.